Climate change has increased the likelihood of more severe and frequent storms, which in turn raises the risk of flooding. TRCA Flood Risk Management plays a key role in providing municipalities with the information they need to respond to flooding. When rain falls on the ground, or when snow melts, the water either infiltrates the soil or becomes surface flow (also known as runoff). Surface flow rapidly travels overland and through storm sewers, reaching watercourses and causing water levels within the rivers to rise quickly. Factors that contribute to flooding include the amount of surface runoff, as well as the characteristics of the watershed (percentage of impervious surface, soil type, slope, etc). Due to the urban nature of the GTA, much rainfall becomes runoff, causing water levels in streams and rivers to rise quickly. Watersheds with these characteristics are called “flashy”. Floodplain management is a fundamental practice of TRCA, which is achieved through policies that restrict development within the floodplain. In locations where the floodplain remains undeveloped, the risk to life and property is reduced. 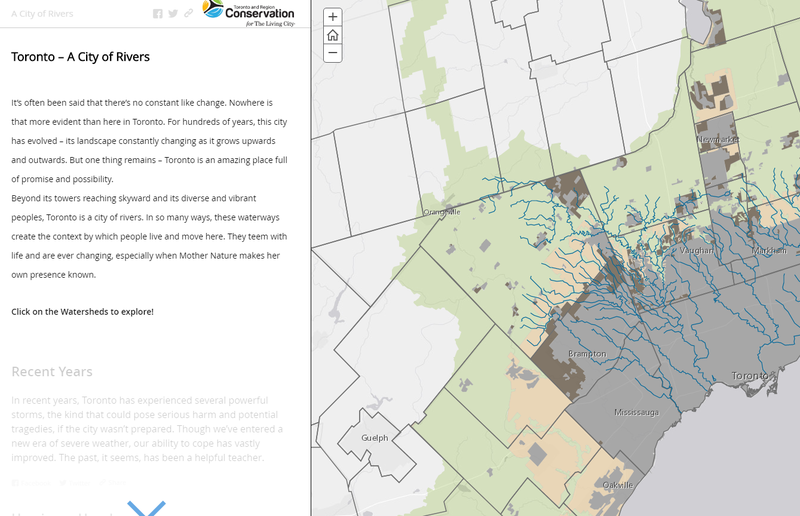 To view the extent of the Regulatory flood plain within TRCA’s jurisdiction, please click here to access TRCA’s Flood Plain Map Viewer tool. There are thousands of flood-vulnerable structures located in the floodplain within TRCA’s jurisdiction, either because they predate our floodplain management practices, or because they were permitted under special policy and planning provisions. To learn more about the rules and regulations regarding development within a flood regulated area, please see TRCA’s Planning & Permits section. Climate change has resulted in a number of changes to our weather patterns including more frequent, powerful, and unpredictable thunderstorms resulting in large amounts of precipitation in short time periods. The result is almost immediate and devastating flooding. This has been challenging for the municipalities within our jurisdiction. TRCA Flood Risk Management is a crucial partner in providing information that informs municipal response to flooding. This includes updating our information as science evolves in this area. 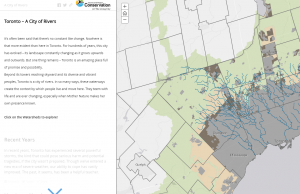 It is important to note that TRCA’s mandate addresses riverine flooding, which occurs when water levels rise and the watercourses overtop their banks. Urban flooding is caused by the limited capacity of existing stormwater infrastructure or drainage systems. It is defined as street flooding, basement flooding, and flooding of other low lying urban areas. Please contact your local municipality for more information. 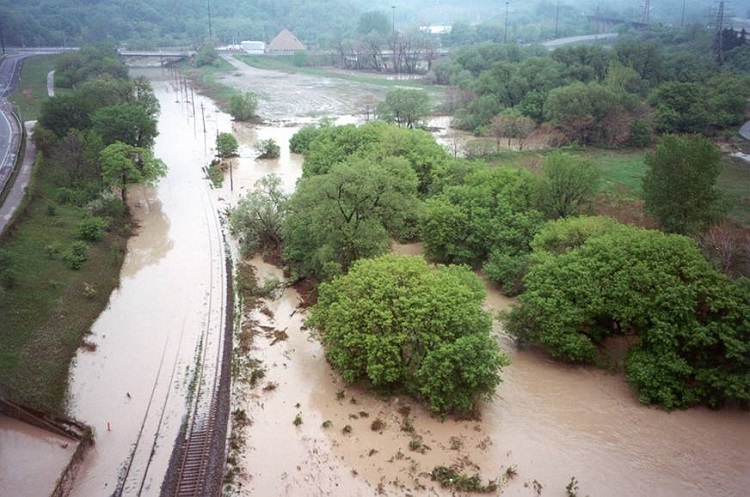 The flood message terminology was developed by a committee that included Conservation Authorities, Conservation Ontario, the Ministry of Natural Resources and Forestry (MNRF), Environment Canada and other agencies. Monitoring weather and flood conditions is a shared responsibility of Conservation Authorities, MNRF, and Environment Canada. The MNRF Surface Water Monitoring Centre in Peterborough monitors weather forecasts and water levels across the province, providing the information to Conservation Authorities. Other information is also available from Environment Canada. When flooding is possible or about to occur, TRCA issues flood messages to designated individuals within municipalities, local agencies, school boards, and the media. These individuals are responsible for relaying the message to relevant individuals and departments within their organizations and activating municipal emergency response procedures, which includes taking actions to warn local residents. Flood messages are posted in the Flood Forecasting & Warnings section of TRCA’s website. For additional information please contact TRCA’s 24 Hr Flood Line at 416-661-6514 or 416-661-6600 ext 5697 or visit us on Twitter. For information on the roles and responsibilities of Conservation Authorities, Municipalities, and the Province please view our 2019 Flood Contingency Manual.